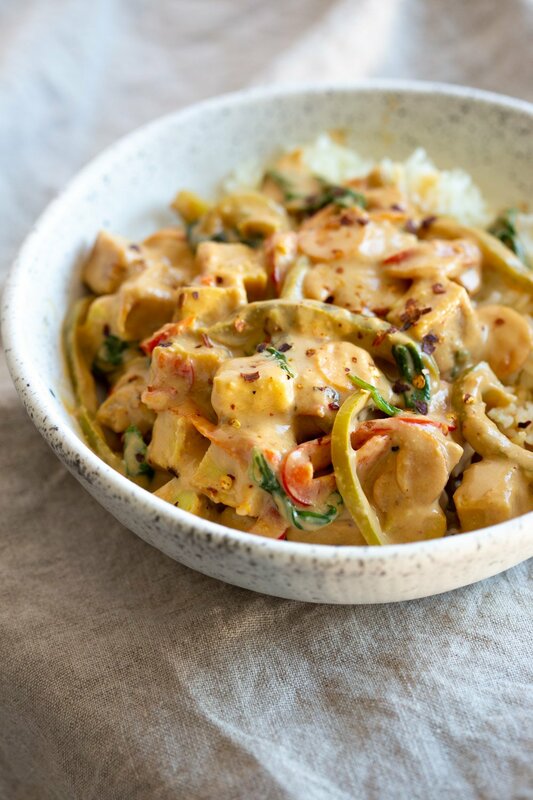 I love quick 1 Pot stir fry meals with creamy thai style peanut sauce. Add some veggies or tofu or some lentils and its a delicious meal! Many of you avoid nuts or soy or both. So I went about making an allergy friendly version. The tofu here is chickpea flour tofu, no soy!. The Peanut sauce uses sunbutter, no nuts and no soy. This whole meal takes just minutes if you have already prepped chickpea tofu. Add veggies of choice and serve over grains or noodles! 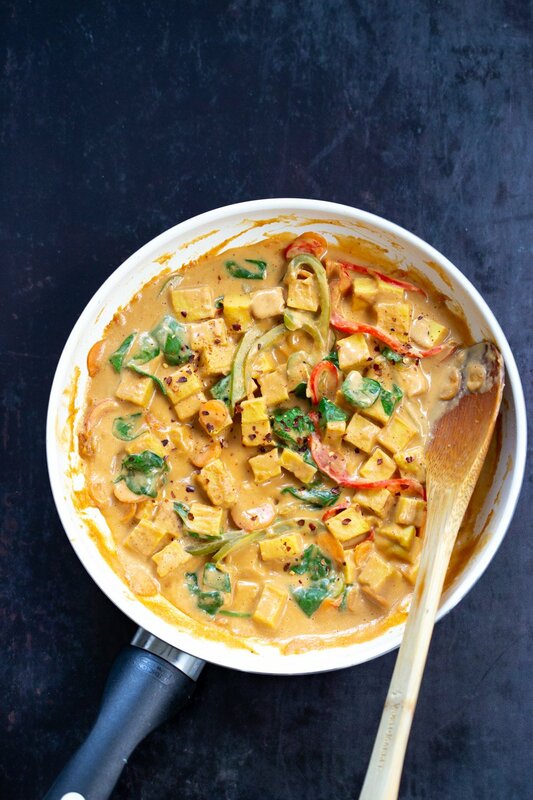 Lets make this Stir fry with chickpea flour tofu and Peanut free Peanut Sauce! If you try it, let me know how it worked out. 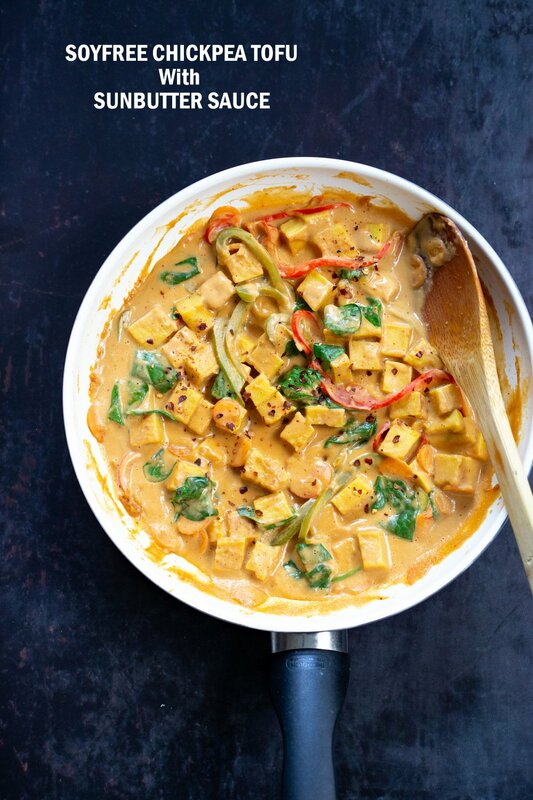 You want to crisp up the chickpea tofu before adding to the sauce. That helps it hold its shape and also have better texture. Adding it directly to a hot sauce can make it a bit sticky. Soy-free Tofu Stir fry with Sunbutter Sauce. 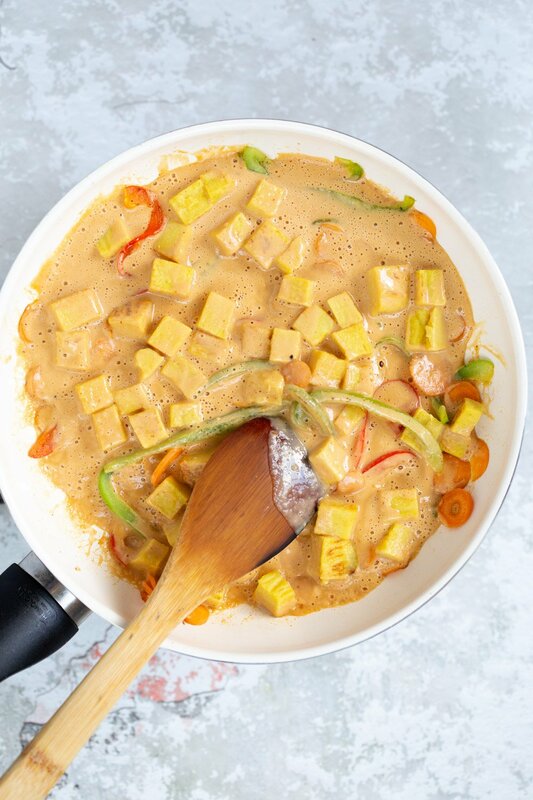 Chickpea Tofu with Nutfree Peanut Sauce! Allergy friendly 1 Pot Meal. Vegan Glutenfree Soyfree Nutfree Recipe. 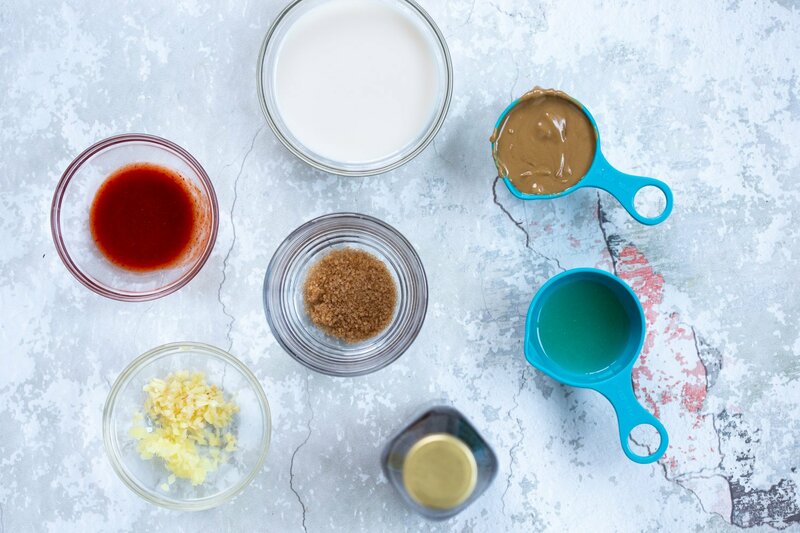 4 tbsp (4 tbsp) sunbutter (sunflower seed butter), or use oeanut, almond or cashew butter for nut sauce. 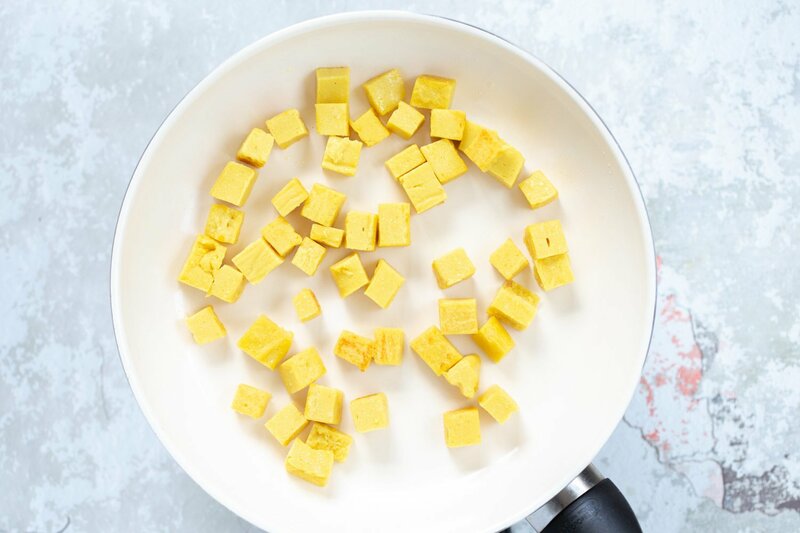 Prepare your chickpea tofu if you havent already and chill for 15 mins then cube. Blend sunbutter sauce with 1/2 cup coconut milk and set aside. Heat oil in a skillet over medium heat. When it has heated, add cubed chickpea tofu and cook for 3 to 4 minutes. (You can toss the chickpea tofu in 1 tbsp cornstarch before roasting to make it crispier). Remove from the skillet. This helps the chickpea tofu hold shape and not get sticky in hot sauces. Add veggies and a teaspoon of oil and cook for another 3 to 5 minutes. Add a generous dash of black pepper and mix in. Then add the chickpea tofu. Serve over noodles or rice, lettuce, with lemon/lime juice, sriracha or pepper flakes and cilantro. 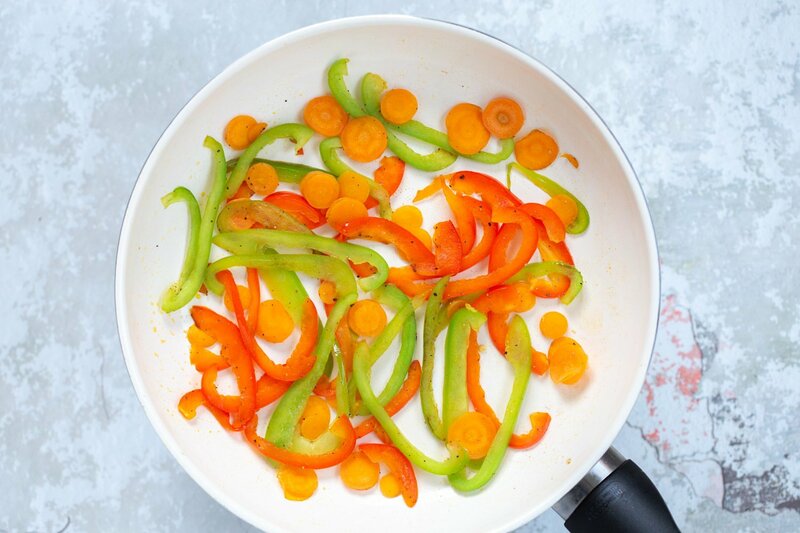 To make oilfree: omit the oil and use broth to saute veggies. Dry skillet to toast the chickpea tofu. Nutrition is for 1 Serve, does not include noodles or rice. Is it 1 tbs choppet ginger, or gingerpowder? Vegan Richa does it again!! This was amazing! 😍😍😍 I mean really just perfect! I didn’t have lemon juice and it was good just with the vinegar. Also used frozen veggies and normal tofu. 30 minutes to heaven! What a stunning dish, I can’t stop taste tasting it!! 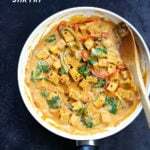 I used plain tofu and peanut butter as I had both on hand, used the entire small can of coconut milk – 1/2 in the sauce, 1/2 with the water to rinse out my jug (I needed it all due to the cornflour on the tofu). Next time I think I’ll use a wok to cook it. Oh this looks delicious! The best part is it looks really easy to make too, thank you! What a beautiful looking curry! My Food Science club actually created this black bean tofu last year and I adored it! I’ve been meaning to try out making chickpea flour tofu for the longest time but I’ve been hesitant with it. I’m afraid I’d ruin the recipe! Soy- free tofu, who knew!? Looks absolutely scrumptious. Thank you Richa for your vegan fabulousness. There are many great vegan chefs, but you truly rule!